Lobby our Government, both State and Federal, to have Theatre in Education – TIE (filmmaking is a natural progression) added to the National Education Curriculum. To expedite our goal we would setup its own Foundation and theatreineducation.org.au website and Theatre Channel. The reality is that we live in a world of ever increasing demand for the Producers of Content — scripting, acting, set design, costumes, editing, photography, directing, producing. Theatre is where the interesting, creative jobs are going to increasingly be. Theatre is a thousands of years old industry that will not become obsolete, and it complements new Film technologies. Our guidepost is little known Betty Burstall, founder of La Mama experimental theatre in the 1960s – “the medium is the message” – revamped to the modernday to make TIE financially viable that means utilizing Social Networking so our Local Sponsors are guaranteed a ‘bang for their buck’. So if we already have in our Education Curriculum the ‘extra activities’ to the ‘3Rs‘, like: Art, Music, Dancing, Library, Sport, Debating, Chess, Languages, Religion… isn’t it time we make “Theatre & Film Studies” compulsory. And why not have more School Excursions to the Local Theatre, which would be a direct benefit to their career options and helps the tickets sales of the Local Theatre, ensuring their viability. Such excursions would be much more practical and cheaper for parents than the usual ones, like $20 to go all the way across the City to see some Imax movie. For starters, there would be no need to catch a bus. They spend some 1 – 2 hours a week on these activities, a lot of kids don’t do religion these days and are pretty much idle while that’s going on. Imagine if 1 – 2 hours a week was spent on Theatre and Film – by the time they are 18, which activity is going to be most likely to give them more career options? Really, think about it, who’s gonna have the interesting, creative careers, where the money is. Even for ‘Early Stage 1’ (K-2) working with plays makes learning to read and write fun, not to mention with the technology available today, kids can film anything and upload to Youtube with mobile phones, on the spot. Prime Minster Julia Gillard’s “National Curriculum” is seriously lacking for not including it (couldn’t find anything on their cumbersome website). Kids and their parents shouldn’t be limited to having to fork out hundreds of dollars to join a Youth Theatre (or a private commercialized version of TIE). Let’s just make Theatre a compulsory fun subject, that should be a critical part of the National Curriculum (with complementing studies in ongoing moderm filmmaking technologies a natural progression). Australian kids are being left behind by our shortsighted leaders who are preoccupied with the Mining Industry. And while all this is going on, there are no fresh ideas for tackling the age old problem of financially struggling Theatres, constantly looking for government grants. The answer is in our kids. If some of us would show them the way. And prominent leaders and veterans of Australian Theatre are being shamed by the efforts of those in the other Arts. But between Theatre and Arts which is more relevant to the Demand for Content phenomenon. Some schools are with it, others just don’t get it – go to the ABC Catalyst segment on “Future Classroom” aired 17 February 2011. Why aren’t all schools heading in the direction of TIE molding tried and true, thousands of years old Theatre technique – one of the oldest and most durable careers you can have, obsolete proof – with these new technologies. Why isn’t it part of the National Curriculum already? 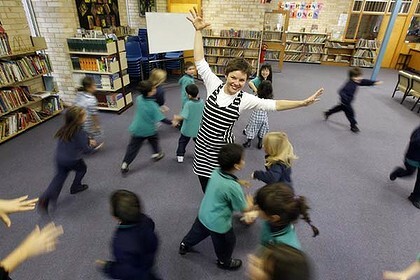 We all know it will never happen in our local school unless we name and shame (see Fair Dinkum Australian Ratings) the right people who should be doing the moving and shaking. If we are really going to shake a spear at ignorance, the area in which we are based, the traditional heart of Australia’s Entertainment & Theatre District – Darlinghurst / Potts Point / Kings Cross, with Fox Studios not far away – should be pioneering the way for TIE. Baz Luhrmann lives just up on the hill at historic Iona House and will be making The Great Gatsby at Fox Studios. He is the ultimate prodigal son for the area, and has roots in both Theatre and Film already – including a modern interpretation of Romeo and Juliet with Leonardo Di Caprio, who will also be his Gatsby. Why don’t we have school excursions to Fox Studios, especially during the making of Gatsby. Come on Baz, and John Bell (Bell Shakespeare), and Cate Blanchett (Director of the Sydney Theatre Company), and Sam Strong (new Artistic Director of the nearby Griffin Theatre), and CEO of our Sponsor lets get Theatre in Education up and running by shaking a spear at ignorance. Cate Blanchett gets the photo op for the elitist Establishment’s Sydney Theatre Company – they think that they are doing such a wonderful job with their program having grown from 5 Sydney schools in 2009 to 18, very lucky schools, in 3 years. At that rate Tara’s school should get it by the time she is 84 …well if she repeats Year 6 a few times she might see it. And no doubt it’s the STC program aforementioned where the parents have to pay. Bet if our HMD eBook comes to Frankensteinian life with that lightning bolt and we can set up a fair dinkum TIE Foundation we can get more than 18 schools by 2014 adding TIE to their curriculum, and at no cost to parents. Now in an interesting coincidence at our Local Primay School, where there hasn’t really been any proper TIE (not counting last year, 2010 when for part of the year there was supposed to be a weekly lunchtime Drama Club, but they never actually worked on a Play, and it was invariably cancelled, yet still appeared on the school report) . Then out of the blue, this year (2011) an after school drama class was announced at the daily assembly. Immediately one young boy blurted out, “Is it free!” (no doubt he was used to hearing his parents’ lament). Heard nothing for a while, then a note comes home about something called “Creative Drama”. Could it be an amazing coincidence that all this was hot on the heals of the release (March 2011) of the revamped My School NAPLAN website and the SMH article about Glebe Public School. May be the My School shaming aspect is working. Hopefully the new in-class, part of the new curriculum drama class will develop week by week and be just as good, if not better. You would certainly think there is no reason why the school’s teachers can’t definitely improve as quasi Drama Teachers as time goes on, you know, pick up some teaching aids from the Internet or something. So that after 9 weeks, we won’t have to worry about the after school one anymore. And dare we hope there could actually be an End of Year School Play, where you might get to see your kid spruik a few lines – like Just Macbeth’s [Lesson 1: “Macbeth” = Son of (Eliza)beth] “what’s done is done” routine? – instead of the usual 7 dance numbers from every class. And dare we hope further that in 10 – 15 years all this evolves into having a ‘dramatic’ effect on their careers. So checked out the website on this Creative Drama Class info sheet, and looks rather odd – seem to be a Queensland mob (there’s no contact webpage with an office street address, just email and mobile) – strange they couldn’t find one based in Sydney – even the school up the road have been using one for years. And of course, even more odd that we have to use people from the Gold Coast, but couldn’t get something going with a Local Theatre (admittedly, we are talking about new Artistic Director Sam Strong of the Griffin SBW Stables Nimrod Theatre who sees no local community obligation to trundle down the hill and at least introduce himself to the Principal) in the most famous Theatre district in Australia. Graeme Blundell mentions in his autobiography The Naked Truth (p 238) that back in 1976 when he was “trying to covert Gordon House, a massive derelict building at the edge of the city (Melbourne), into an exciting ‘theatre’ environment… funding ro convert the Gordon House building and forming a new theatre to stage plays…” He got help from Margot Hilton, “she was the drama officer to the state government’s Minister for Arts. http://www.smh.com.au/news/obituaries/driven-by-an-artistic-passion/2005/11/10/1131578167621.html?page=3 ) – this is all back in the 1970s – has any NSW Premier since (or is that ever), and will new Premier Barry O’Farrell, have a “Drama Officer”?! and were already attracted to Thirroul for our work on our DH Lawrence Play – clearly from Graeme’s bio his ex-wife Wendy’s demands for half Brett’s Art was a catalyst for his ultimate demise) Graham Kennedy, columnist for The Australian. Who better to produce eulogies to creative Australians (though his wife Susan Kurosawa jibes he now has the “Dead Celebrities Round”). If only we could tap into all that experience – can you imagine how important he could be as a Godfather to TIE. He even used to live near our School in Surrey Street, so his kids would have gone to school here. You do still see a lot of old derelict buildings around – and have our own TIE Theatre, School Plays from around NSW, Annual Competition and Awards Night, webcams everywhere, straight to Youtube and one day our own TIE Theatre Channel on ‘Your ABC’ (after Mark Scott dies) and/or Rupert Murdoch’s Foxtel. As Graeme Blundell’s life in Theatre has shown you need a viable business model, not just government funding and reciprocal altruism on the part of those with money, but our Local Sponsors getting a bang for their buck – parents favouring their product and even product placement in the script – all spotlighted with Social Networking Media. At our local Primary School several years ago the Kings Cross Rotary Club renovated the School Hall, and put in beautiful new stage curtains. They have never been opened and closed since. The kids have never once put on a school or class play on that stage – it’s used for every thing else – school assembly, dance, gym – everything but Theatre. In the school’s 1983 Centenary Commemoration booklet the plan of the school’s classrooms show they used to have a whole classroom dedicated to Filmmaking. Some where along the line that was deemed as useless to the kid’s education and career development. Jack Thompson used to live in the area. When we became connected with the school, can remember seeing George Miller drop his kid off too. 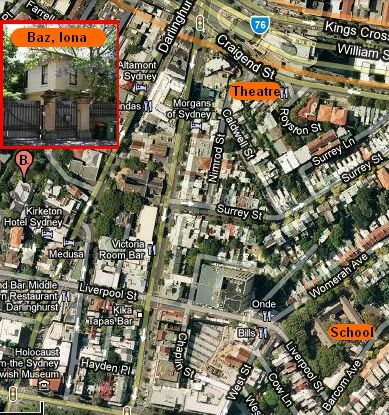 George has his Film production nearby in Macleay Street Potts Point not far from his old Metro Theatre facility in Orwell Street where he shot part of Mad Max with Mel Gibson. Also saw George on TV doing a pep talk to students at NIDA. But nobody thought to have him do the same at the school. And of course as mentioned above, we have Baz Luhrmann up the road.